We are thrilled to announce that we are now supporting a fantastic Elephant Conservation project in Cambodia, which volunteers can join to assist the local team’s elephant conservation and community development initiatives. I recently visited Cambodia for the first time to visit our new Elephant Conservation project. Arriving into Phnom Penh, I was met by the driver and transported via tuk tuk to the hotel that volunteers stay in before heading east to the project. 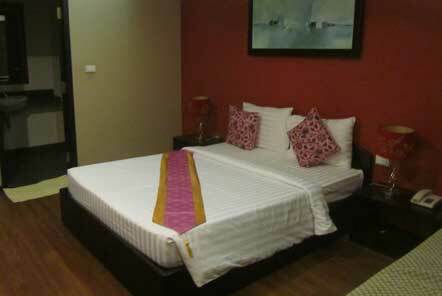 The hotel is very friendly and volunteers are provided with an en suite room and use of the pool. I dropped my bags off and went for a walk around the city. The first thing that hits you is the amount of traffic so do take care when the crossing roads (especially when jet lagged)! There are always plenty of taxi drivers around in case you have walked too far and need a lift back to the hotel. Volunteers are provided with a $10 voucher to use at the hotel and this is enough to get a main meal for dinner and 1 or 2 drinks. The food was really nice, generally you will find that Cambodian food is like Thai food, but less spicy. Fried noodles and rice dishes are common. After a good nights’ sleep it was time for breakfast and the hotel also provide a packed lunch box which you can fill for the journey to the project. I met the other new volunteers and at 7.30am we were met by our driver who drove us up to Sen Monorom which is the closest town to the project. The drive took around 6 hours with a couple of stops on the way. On arrival into the town, we were able to leave our bags at the cafe and explore a bit of the town or relax in the cafe gardens with a cold drink and a piece of their famously delicious cake. At 3pm we were met by more of the project staff and transported to the project which took around 30 minutes. This is when we got to meet the other volunteers who had already been at the project for at least a week and had been spending their weekend in the local town and were ready to head back to the project, telling us tales of their last weeks on the way. This whetted everyone’s appetite for the week ahead. We arrived at the top of the hill with a great view over the forest below and this is where we left the vehicles to make the rest of the way by foot. On arrival at the camp we put down our bags and sat around the table to learn more about the project, what role volunteers play within the aims of the project and went over some housekeeping rules for the camp. It was then time to see our rooms for the week which are basic, shared but comfortable and have an amazing view of the forest outside. After some time to settle in and shower we heard the gong, this meant dinner was ready. The food was plentiful and very tasty, the food is traditional Cambodian dishes and there is always fresh fruit available. Electricity at this project is powered by a generator which in on between 6pm and 9pm. This means that most people go to bed by around 9pm which seems early but throughout the week you’ll find that working quite long days in the heat means that you’re ready for an early night! The next morning the gong went at 7am to signal that breakfast was ready. After breakfast everyone met ready to leave for morning duties. We checked the rota board which shows who is assigned to what duties that day and I was on elephants that morning. John, one of the members of staff at the project, gave us an induction regarding the elephants at the project and a safety talk before heading down into the forest to meet some of the elephants. 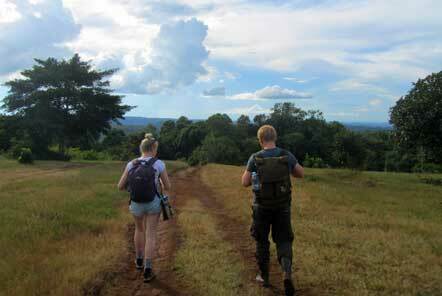 We trekked down into the forest for about 40 minutes before seeing the elephants approaching. We spend the whole morning with a group of 4 elephants, learning their stories of how they ended up at the project. All of them had been previously overworked by their owners in order to try to make a living for their families and they are now able to retire in the forest, without having to work again, they can roam the forest, eat as much as they need to and have access to veterinary care when needed. For me, the two most rewarding parts of being on elephant duty was the amount you could learn during your time there, both by your own observations in order to get to know each elephants’ individual personality and from asking the mahouts and guides and also the fact that you could just watch elephants being elephants (or at least learning how to be elephants). We watched them in the river, playing in the water, some submerging themselves completely, others being more cautious. The mahouts threw buckets of water over them assisting them to wash and encouraging them to demonstrate these natural behaviours themselves. 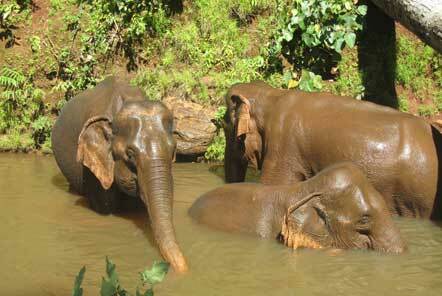 The elephants considered a mud bath and then decided against it and wandered into the forest. That’s the great thing about these elephants now, they’re in a position where they can change their minds and do as they please as they are free to make their own choices. They are not forced to do things that they do not want to do as they have been previously. These elephants tend to come from logging, construction or tourist backgrounds where they have been told what to do their entire lives (when they can walk, eat, drink etc) so it can take some of these elephants a while to get used to making these decisions based on their own needs and it’s fascinating to see the way that other elephants in the herd who have been there a bit longer are able to teach the newer elephants how to be elephants again rather than workers. We trekked back up to the camp which was up quite a steep section and took around 45 minutes so we had plenty of water stops on the way to remain hydrated and by the time we got there we were definitely ready for the sound of the gong signalling lunch. 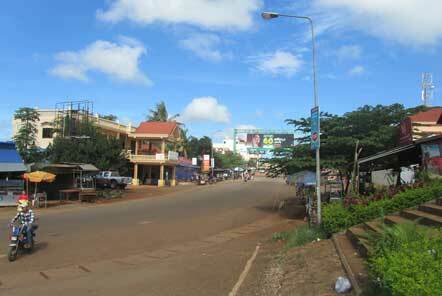 After each lunch there is a break (Cambodian siesta time) where volunteers can relax during the hottest part of the day. We were assigned to elephants again for the afternoon as it was our first day; generally volunteers will spend a morning or afternoon with the elephants each day, and the other half of their day assisting with a project such as farming, harvesting fruit trees for the elephants and constructing items for the local community. 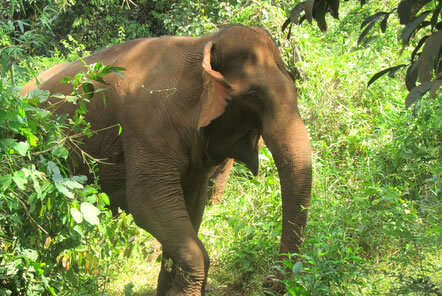 We walked down to meet a pair of elephants who live in another area of the forest. We watched them bathing in a beautiful part of the river and observed them in the forest. Although these two were a bit closer to camp, they were a bit more active than the 4 we’d spent time with in the morning and so there was still quite a lot of walking involved. We made our way back to the base camp at 5pm and had time for a quick shower before dinner at 6pm. Due to the remote location, evenings are quite quiet at the project and volunteers generally use this free time to get to know each other, read or play cards. Our next morning was spent making pig enclosures for some families in the local community. This is part of a scheme whereby the project has asked the village chief which families are struggling most and would benefit from having a pig donated to them in order to kick start a business. They are donated one female pig who, when old enough, can mate with a male pig in the village and have piglets. Once the piglets are old enough, the family gives the original pig back and one piglet and can keep the rest of the litter in order to raise them and when they are old enough they can sell some of those pigs for meat and keep some for breeding in order to create a long term income for the family. Three families have been elected to benefit from this scheme at this stage but it is expected that more will do so in the future. We found scrap wood around the camp that could be used to make raised beds for the pigs to sleep on. We also searched for poles for the roof support and corner posts to keep the whole structure together and stable. 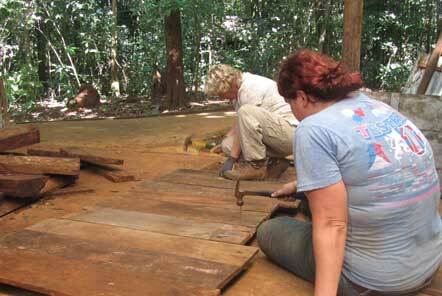 We began by cutting down some trees which could be used for the roof supports. My subgroup focussed on the beds, so we used sleeper style pieces of wood and attached them using poles in order to create a bed and then cut sections of wood which could be attached to this in order to raise them off the ground. This is to keep the area ventilated and keep the pigs out of the wet and away from ants. The other subgroup worked on finding trees that were suitable for the corner posts of the enclosures, cutting these to size and sawing the bottom of them into points so they could easily be hit into the ground at the family’s house. In order to transport the pig enclosures, they cannot be constructed until at the family’s house so we were essentially trying to make IKEA style flat pack pig enclosures! 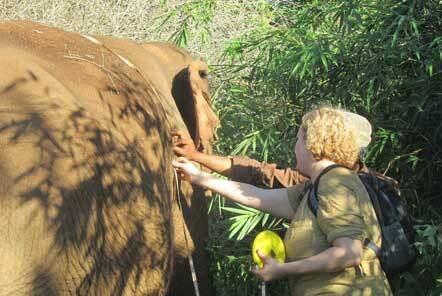 The afternoon duty was health checks on the group of 4 elephants that we had met on the previous day. Unfortunately one didn’t come up from the forest to the checking spot and so would be checked another day this week and one of the others did come up, and then decided to go back to the forest, so again would be checked another day so we just had 2 elephants to check that afternoon. At the end of the health check, you give the elephant an overall rating of 1-9 (1 = skinny, 9 = very healthy). All of this data is recorded and kept in a database in order to track the elephant’s health over time. The elephants are given a health check once per week or twice per week for elephants whose health is a particular concern. Health checks were one of my favourite jobs as it was so interesting to learn all of the indicators of health in an elephant. It’s a fantastic project for anyone who has a real passion for elephants and its integration into the local Bunong community makes it very varied and incredibly worthwhile. Find out more about the Elephant Conservation project and how you can join. If you’d like to hear about previous volunteers’ experiences at this project, please click here.